Located 154 km north of Vientiane and 181 km south of Luang Prabang, the scenic small town of Vang Vieng is a logical stop for travelers journeying overland in northern Laos. Once no more than a sleepy unknown village on the bank of the Nam Song River, Vang Vieng became a backpacker’s haven after a group of locals started floating down the river on large truck tire inner tubes. As the town’s tubing craze increased, tourism boomed, attracting large numbers of young backpackers who consumed vast quantities of alcohol and drugs while tubing and playing in the river. 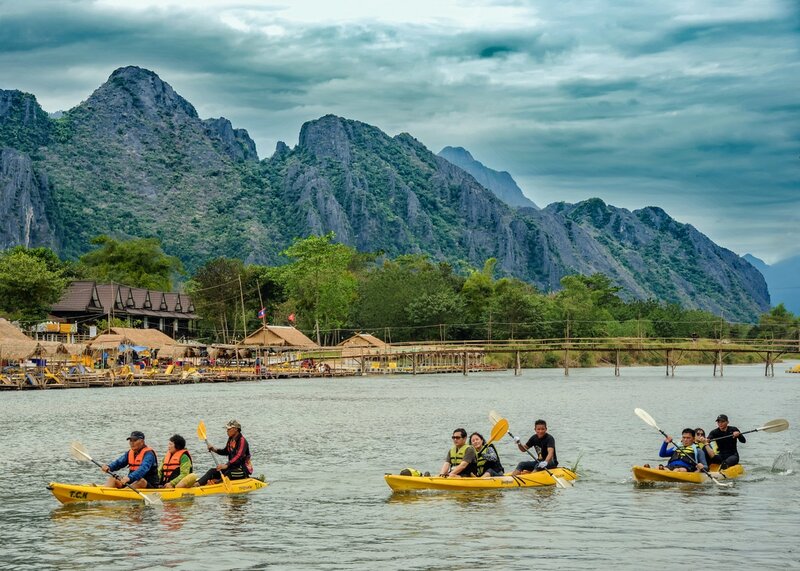 This led to a staggering number of serious injuries and fatalities which resulted in international pressure on the Laos government to clean up the formerly unregulated tourism industry in Vang Vieng. ​Although the town still attracts backpackers, tubing has largely been replaced by kayaks as the town has transformed itself into an ecotourism destination. Trekking is now a popular activity as is rock climbing on the beautiful karst hills and mountains that ring the valley where Vang Vieng is situated. Interestingly, the town has recently become very popular with South Koreans. The Koreans began flocking here several years ago after a couple of celebrities chose Vang Vieng as their vacation destination. A number of businesses catering to Koreans including hotels, restaurants and a large convenience store have opened to suit the tastes of the newest group to “discover” Vang Vieng. The town itself is small and compact and can easily be walked. To describe Vang Vieng as tourist friendly is an understatement as the main tourism hub, just north of the bus station, is chock full of bars, restaurants, souvenir shops and convenience stores. Numerous travel and tour agencies can be found here so booking activities like kayaking or rock climbing is very easy. Bus tickets for onward travel can also be purchased from these agencies although most, if not all, of the town’s many guest houses are more than happy to arrange bus transportation. There are also several popular sights to see within easy walking distance from town center. Tham Chang Cave is a pleasant 20-minute walk south of town on the opposite side of the river. The river is crossed via a surprisingly photogenic and well-maintained suspension bridge. Easily found on Google Maps, the cave, which is accessed by a fairly steep staircase. At the bottom of the staircase are a small picnic area and a Buddhist Shrine. 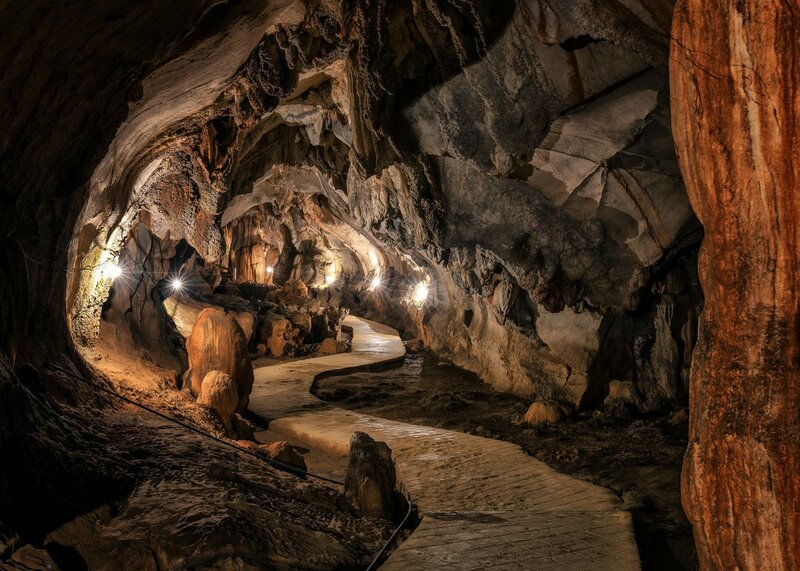 Unlike many caves found in Southeast Asia, this one is very large, dry and quite well lit. 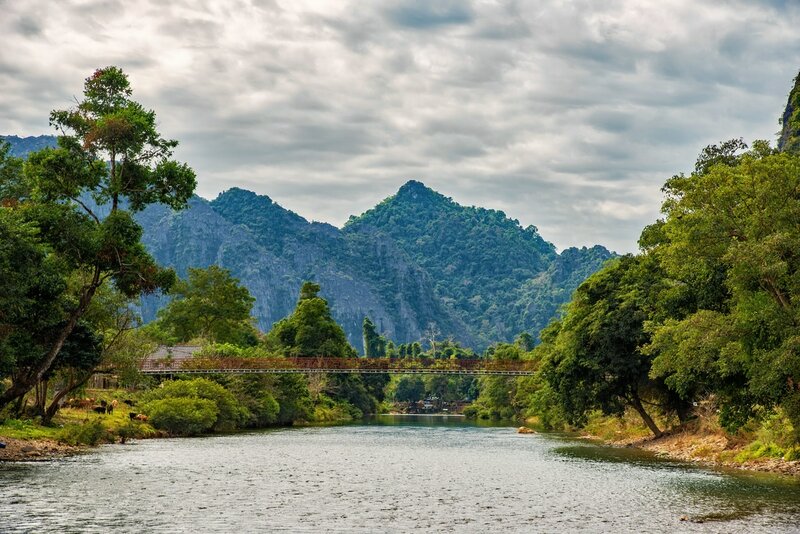 Another sight within easy walking distance of town is Pha Poak, a karst limestone hill which provides a stunning view over the valley and across Vang Vieng. A well-marked path guides visitors from the bamboo bridge in the center of town through a maze of farmer’s fields on the west side of the river. The hill can be recognized easily as there is generally a red flag flying on its summit. Be forewarned that scaling the hill is not easy and requires proper closed-toe shoes — flip flops or sandals won’t do. Simple homemade steps with rickety bamboo handrails lead climbers up and over very jagged and sharp limestone boulders. This thirty-minute climb is not for the faint of heart. The view from Pha Poak is definitely impressive, but for an even better view we suggest taking a ride in a hot-air balloon. During the dry season hot-air balloon rides are offered at both sunrise and sunset, giving visitors a unique opportunity to float across Vang Vieng. Although the ride is sold as 40 minutes for $90 USD in reality the balloon will be in the air for roughly 30 minutes, plenty of time to get some great photographs of Laos’ beautiful countryside. At this price, which includes transportation to and from hotels and guest houses, Vang Vieng is one of the most economical places on the planet to go for a balloon ride. ​Vang Vieng can be easily reached by bus from Vientiane or Luang Prabang. These are very well-traveled routes for both tourists and locals. Bus tickets can be easily purchased at the stations, (these towns all have several bus stations) travel agencies or hotels and guest houses. It should be noted that when purchasing tickets from hotels and travel agencies you will pay more than if you had bought the ticket at the bus station. However, the fee, a few dollars at most, will include transportation to the bus station. In our opinion this is a fair deal which insures you arrive at the correct bus station at the proper time. From Vientiane numerous buses and mini-buses (vans) depart the city throughout the day. Catch a simple bus with the locals and pay as little as 40,000 LAK or less than $5 USD. Splurge for a “VIP” tourist bus and pay three times the price. Travel time varies greatly but should be roughly three to four hours. Similar to the Vientiane to Vang Vieng leg, numerous busses and mini-buses (vans) travel back and forth between Vang Vieng and Luang Prabang. Buses are often described as “VIP” or “express” which realistically is very much an exaggeration. Expect the trip to take from six to seven hours and cost around 120,000 LAK or around $14 USD.